Dubbed “heaven’s trumpeter” by the Toronto-based ensemble Arraymusic, 26-year-old Amy Horvey is one of Canada’s most versatile and original emerging young trumpeters. Amy received her BMus at the University of Victoria with Lou Ranger, where she was the winner of the University’s Concerto Competition. After her graduation from the University of Victoria, she studied at the Glenn Gould School with Andrew McCandless. While playing in the National Youth Orchestra in 2000-2002, she studied with Vincent Cichowicz and Larry Knopp. From 2003-2005 Amy studied with Andre Heuvelman at the Rotterdam Conservatory, graduating with the highest possible honors in 2005. She also studied privately with Dutch trumpeter Marco Blaauw and followed courses in electronic music in Rotterdam. While living in the Netherlands she was the winner of the Jury Prize of the 2004 De Link Competition, premiered Philip Matuczewski’s Concerto for Trumpet, and performed in the Holland Festival’s production of John Taverner’s The Veil of the Temple. Exploring new forms and performance approaches, Amy composed and performed the score to the dance work F’Dom, a collaboration with choreographer Agnija Seiko Sarulienne which toured the Netherlands, France and Lithuania. Since her return to Canada in 2005, she has worked with wide range of performance projects of the highest caliber, including collaborations with Soundstreams Canada and Arraymusic, with whom she performed at the National Arts Centre’s English Theatre. 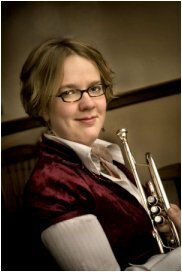 In 2006, Amy toured Canada with “The Perspective of Disappearance”, a program of new music for solo trumpet sponsored by the Saskatchewan Arts Board. This program was featured at such venues as Open Space Victoria and the Vancouver International Jazz Festival. At the invitation of jazz trumpeter Dave Douglas, she presented the program as a featured soloist at the 2006 Festival of New Trumpet Music in New York City. Amy has worked with several major symphony orchestras, including the Rotterdam Philharmonic, the Winnipeg Symphony, and holds a permanent position with the Thunder Bay Symphony. She has commissioned works from many composers, including Marc Yeats, Cecilia Arditto, Christopher Butterfield, Isak Goldschneider, Ryan Purchase, and Daisuke Terauchi.